Deixe os seus filhos animados com a história romana antiga com este tour privado de 3 horas "Colosseum for kids". Visite os principais pontos turísticos da Roma antiga - o Monte Palatino, Fórum e Coliseu - com um guia especializado para crianças. Saiba como era a vida diária na Roma antiga e como eram os combates de gladiadores no Coliseu. Desfrute de recursos visuais usados pelo guia para envolver toda a família. He was great with kids. Lots of learning. Our guide made our trip wonderful for adults and kids alike! She walked us around the area and gave quite a bit of history. She came equipped with pictures depicting images which described how the area looked historically and engaged our children with questions. It was a quite warm during our time at the Colosseum and our guide was very good at explaining things to us in the shade and then taking us to see what she was discussing. She was also very helpful in suggesting where to eat and how to get around the area. Great tour with a very knowledgeable guide called Mateo. Maybe not ski child related but my husband and I loved it thanks to Mateo. Unser 3-stündiger Trip zu Kolloseum, Palatin und Forum Romanum mit 2 Kindern 6, 7 war einfach perfekt Elisabetta hat es verstanden, die Kids mit Schautafeln und Geschichten zu begeistern - vor allem das Kolloseum hat es den beiden besonders angetan. Wir Erwachsenen sind in den Genuss eines fundierten kunst- und kulturgeschichtlichen Überblicks gekommen. Die Buchung einer zertifizierten Führers ist jedenfalls zu empfehlen, wir wurden ohne jede Wartezeitan den in der Schlange stehenden Touristen vorbeigeschleust das wäre auch mit individueller Vorausbuchung nicht möglich gewesen. The Colosseum tour was awesome. Our guide wish we could remember his name was waiting for us at our meeting location. He was very enthusiastic and had a very good command of the English language. His knowledge kept us all engaged even in the uncharacteristic heat. 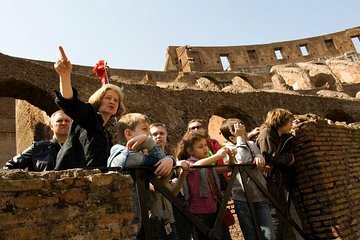 We would recommend this tour to anyone wanting to see the inside of the Colosseum with kids. Good. Not very child friendly. Grace was amazing -really engaged the kids and we learnt a lot too. Danke an Renata, das hat sich sehr gelohnt, unglaublich viel Info für jedes Alter u d dabei extrem geduldig!